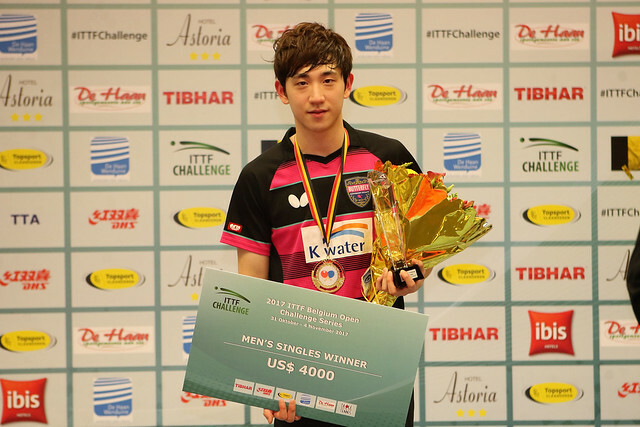 Tuesday 31st October marked the start of the two-day qualification tournament which precedes the 2017 ITTF Challenge Belgium Open as the unseeded players took to the tables in De Haan, aiming to move closer to the main event. There were a number of surprising outcomes in the Women’s Singles qualification group stage with Leonie Hartbricht and Rebekka Carlsen taking the spotlight. Hungarian competitor Leonie Hartbricht, who is ranked at no. 451 in the world, defied the odds to inflict a shock defeat on Italy’s Deborah Vivarelli (11-6, 11-7, 11-9, 11-7) while the world no.437 Norwegian representative Rebekka Carlsen proved too strong for Russian opponent Anastasia Kolish (11-9, 11-7, 11-6, 11-6). Both Vivarelli and Kolish share 207th position in the World Rankings table. “I am a bit surprised that I played so good. In the morning I was struggling a bit to find my rhythm. Against Vivarelli it all worked out fine, she had difficulties with my serve”, Leonie Hartbricht. Switzerland’s Rahel Aschwanden and Belgium’s Eline Loyen entered their respective groups as the top ranked players, but both contestants endured a difficult opening day to the qualification tournament suffering back-to-back defeats. The home fans had plenty of positive results to cheer about in the qualifying group stage for the Men’s Singles competition as six Belgian representatives ended the day unbeaten. Adrien Rassenfosse deserves a mention for his fantastic performance in Group 13, claiming straight games victories over Slovenia’s Jan Zibrat (11-9, 11-8, 11-6, 11-8) and Nicolas Galvano of Argentina (11-5, 11-4, 11-5, 12-10) to secure top spot in the group. “It’s my first big international tournament. For the moment it’s going great. The Frenchman that I defeated was much higher ranked… For me this has already been a fantastic experience”, Adrien Rassenfosse. Fresh from his recent outing at the Liebherr 2017 Men’s World Cup, which was also held in Belgium, Kanak Jha of the USA made a decent start to his campaign with a five games win against Ademir Balaban of Luxembourg (14-12, 13-11, 3-11, 11-3, 11-3) and is one victory away from reaching the main draw.